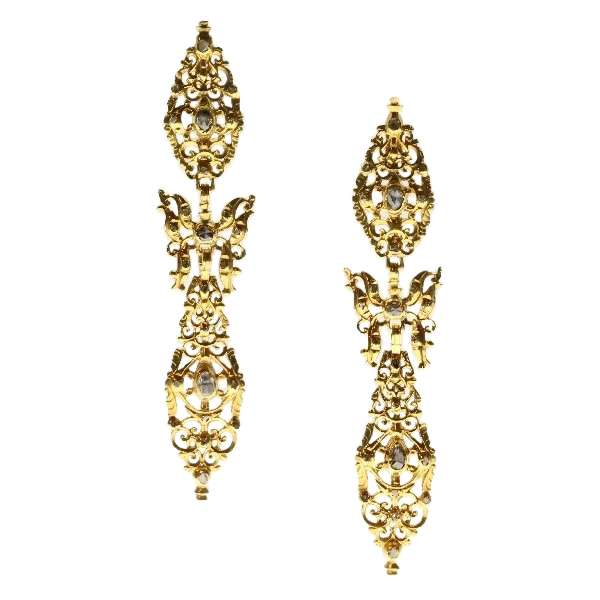 300 yrs old antique long pendent earrings with rose cut diamonds high carat gold: Description by Adin Antique Jewelry. Country of origin: Although it does not carry any legible control marks we believe this to be of Portuguese origin. Style specifics: Rococo is a style of decoration that followed, c.1730, the baroque style in France (where it was also called rocaille), the principal features of which are asymmetry of ornament and a repertoire consisting to a considerable extent of rockwork, shells, flowers, foliage, and scrollwork. It was developed in France under Louis XV, 1715-74, and spread to Italy, Germany, and Austria and to a lesser extent to England. Diamonds: 48 rose cut diamonds and senailles . A senaille is a simplified rose cut diamond, a small diamond chip with perhaps a few polished facets. We do not have the weight of the rose cuts diamonds nor the senailles which is normal in our trade when it comes to rose cut diamonds and senailles.